For biologic transmitters, see transmitter substance. Electromagnetic waves are radiated by electric charges undergoing acceleration. Radio waves, electromagnetic waves of radio frequency, are generated by time-varying electric currents, consisting of electrons flowing through a metal conductor called an antenna which are changing their velocity or direction and thus accelerating. An alternating current flowing back and forth in an antenna will create an oscillating magnetic field around the conductor. The alternating voltage will also charge the ends of the conductor alternately positive and negative, creating an oscillating electric field around the conductor. If the frequency of the oscillations is high enough, in the radio frequency range above about 20 kHz, the oscillating coupled electric and magnetic fields will radiate away from the antenna into space as an electromagnetic wave, a radio wave. An electronic oscillator circuit to generate the radio frequency signal. This usually generates a sine wave of constant amplitude called the carrier wave, because it serves to "carry" the information through space. In most modern transmitters, this is a crystal oscillator in which the frequency is precisely controlled by the vibrations of a quartz crystal. The frequency of the carrier wave is considered the frequency of the transmitter. An exception is made allowing the unlicensed use of low-power short-range transmitters in devices such as cell phones, cordless telephones, wireless microphones, walkie-talkies, Wi-Fi and Bluetooth devices, garage door openers, and baby monitors. In the US, these fall under Part 15 of the Federal Communications Commission (FCC) regulations. Although they can be operated without a license, these devices still generally must be type-approved before sale. The first primitive radio transmitters (called spark gap transmitters) were built by German physicist Heinrich Hertz in 1887 during his pioneering investigations of radio waves. These generated radio waves by a high voltage spark between two conductors. Beginning in 1895, Guglielmo Marconi developed the first practical radio communication systems using these transmitters. Spark transmitters couldn't transmit audio (sound) and instead transmitted information by radiotelegraphy, the operator tapped on a telegraph key which turned the transmitter on and off to produce pulses of radio waves spelling out text messages in Morse code. 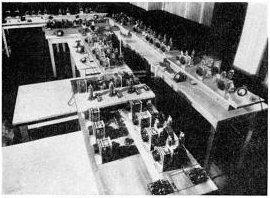 These spark-gap transmitters were used during the first three decades of radio (1887-1917), called the wireless telegraphy or "spark" era. Because they generated damped waves, spark transmitters were electrically "noisy". Their energy was spread over a broad band of frequencies, creating radio noise which interfered with other transmitters. Damped wave emissions were banned by international law in 1934. Two short-lived competing transmitter technologies came into use after the turn of the century, which were the first continuous wave transmitters: the arc converter (Poulsen arc) in 1904 and the Alexanderson alternator around 1910, which were used into the 1920s. The invention of the transistor allowed the development in the 1960s of small portable transmitters such as wireless microphones, garage door openers and walkie-talkies. The development of the integrated circuit (IC) in the 1970s made possible the current proliferation of wireless devices, such as cell phones and laptops, in which integrated digital transmitters and receivers in wireless modems operate automatically, in the background, to exchange data with wireless networks. The need to conserve bandwidth in the increasingly congested radio spectrum is driving the development of new types of transmitters such as spread spectrum, trunked radio systems and cognitive radio. 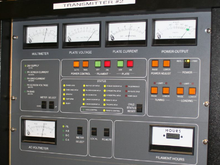 A related trend has been an ongoing transition from analog to digital radio transmission methods. Digital modulation can have greater spectral efficiency than analog modulation; that is it can often transmit more information (data rate) in a given bandwidth than analog, using data compression algorithms. Other advantages of digital transmission are increased noise immunity, and greater flexibility and processing power of digital signal processing integrated circuits. ^ a b Ellingson, Steven W. (2016). Radio Systems Engineering. Cambridge University Press. pp. 16–17. ISBN 1316785165.